When you stay at Wildflower Hall, near Shimla, you may find it almost impossible to pry yourself away from the large bay windows of your room. A sunrise over the Himalayas or a sunset over the giant cedars would prompt a prosaic banker to spout poetry! Stoke the spirit of togetherness within your spacious, sun-kissed room, where Burmese teak flooring and colonial touches lace the ambience with nostalgia. 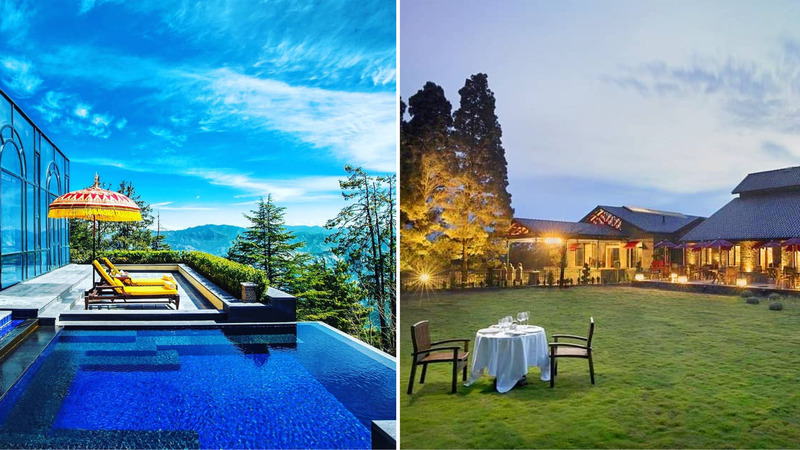 This Oberoi Hotels and Resorts’ property, located 2,438 metres above sea level, resembles a fairytale-like castle hidden in a 23-acre forest of cedars. Everywhere in this heritage property, the Himalayas are the main stage prop–be it in the plush indoor restaurant, the charming conservatory, or the outdoor terrace where the snow-shawled massifs beckon, drawing your gaze ever upward. The days blur past in a haze of walks in scented forests, picnics on windswept mountaintops, and heady drives on cliff-hanger roads. Ever yearned for a massage in the midst of a cedar forest? The Oberoi Spa comes close as its immense glass windows seem to pull the forest indoors. Swim in the indoor heated swimming pool or get pummelled by jets in the outdoor whirlpool. And, the ultimate element of bonding? Meditate together and do yoga in choice locations where the cedars rustle and the mountains loom. Fly into Shimla or Chandigarh. Wildflower Hall is located in Chharabra, a 45-minute drive from Shimla. Or embark on the scenic vintage narrow gauge railway train that meanders from Kalka to Shimla. The nearest railhead is Kathgodam, which is a two-and-a-half-hour drive from the village of Satoli. The hamlet is a seven to eight hours’ drive from Delhi, including two stops en route. The Denwa Backwater Escape is all that it promises to be–an escape from a troubled world. Overlooking the limpid backwaters of a dam that straddles the Denwa river, this lodge unlocks the mysteries of the Satpura National Park, Madhya Pradesh, which lies across the backwaters of the river. Sprawled across 10 acres, the lodge’s eight river-view cottages and two river-view tree houses exude a chic safari lodge style with leather armchairs, leather valises that serve as writing desks and bedside tables while local Bastar art and driftwood sculptures add heft to the décor. And, what could be more romantic than being marooned in a jungle outpost, amidst tawny grasslands that bend in the breeze outside your room’s invitingly large windows? Relax on your wood patio with a cuppa and gaze at the glimmering skein of the waters in the distance, rimmed by the softly undulating Pachmarhi hills. Embark on a boat ride, elephant and jeep safaris, or spend a night in the machan in the buffer zone; walk/cycle or relish picnic lunches. Revel in romantic moments in the dining area with its high vaulted ceiling and scenic veranda. A barbecue bush dinner, anyone? Ignore the eerie rustling in the undergrowth and savour the illusion that you are the only two people in the world. The reserve is located 156-km southeast of Bhopal airport. Itarsi is the closest railway junction (70-km). Denwa is a Pugdundee Safaris’ venture, which has luxury lodges in Pench, Kanha, Bandhavgarh, and Panna national parks as well. The best time to visit is in winters. Under the Jamun tree, an open-sided restaurant at the Jehan Numa Retreat near Bhopal oozes charm and feral magic. Strung with paraffin lamps suspended from the outspread branches of a couple of jamun trees, the outdoor space is studded with candle-lit tables at dusk, with the scented wilderness an arm’s stretch away. Let your pulses race even as your taste buds embark on a roller coaster ride of flavours as you savour royal Bhopali cuisine or a farm-to-fork menu. Located on the edge of Van Vihar National Park, a leafy zoological park, the Jehan Numa Retreat, low-slung and earthy, snuggles in a lush forest glade. Some 2,500 plants and trees grow with fecund energy on this 12-acre, eco-friendly property, fringed by fuzzy purple fountain grass. The faux rustic retreat comprises of 28 rooms in sloping-roof cottages, which shield understated luxury within, while your private sit-out gives you a ringside view of the forest. Bird song greets you in the morning and a civet cat may pad past at dusk, prompting lovers to huddle into the warmth of a blanket. Alternatively, tee off at the pitch-and-putt golfing green; cycle or walk in the Van Vihar National Park or press the pause button with a couple’s massage at the wood-panelled leafy spa. That may be just the moment to declare undying love to each other. Bhopal is well connected by air, road and rail. The Jehan Numa Retreat lies 18-km from Bhopal airport and 10-km from Bhopal railway station. The Jehan Numa Retreat is cool all year-round. Glamping or glamorous camping lends itself to romance–waking and sleeping under canvas albeit crammed with luxurious trappings. The subtly opulent Jawai Leopard Camp in Rajasthan favours a subdued palette of grey, black and white, which finds echoes in the starkly beautiful landscape that surrounds it. A three-hour drive from the fabled Udaipur, the camp is enfolded amidst hard, undulating granite hills and tawny grasslands interspersed with a sea of rocky misshapen boulders. Tall Rabari herdsmen with their signature red turbans stroll with their herds in this parcel of the wild that they know so well. Lithe leopards bask in the sun or snuggle for warmth in hidden crevasses… This is not a wildlife park but leopard country where the felines roam wild and free, and therein lies its charm and mystery. The camp springs from the hard earth like it belongs and its eight tents with en suite facilities flaunt a 1930s style décor with tubular, brushed-steel furniture and designer accessories. After a dusty game drive, nurse a drink on your private veranda and listen to the wilderness as it murmurs its secrets… Later, sit around a bonfire and swap tales with other guests in a paraffin-lamp-lit space. There’s plenty of time to reaffirm your love for each other in this land bypassed by time. A three-hour drive from Udaipur or Jodhpur (which have good air and rail connections), the Jawai Leopard Camp offers wildlife experiences, village outings, walks with a Rabari, cycling to the dam, excursions to the Jain temples of Ranakpur and Kumbhalgarh fortress. Swirling mists, fern-filled forests, a star-shaped lake, rippling streams and weathered stone cottages impart an undeniable come-hither aura to Kodaikanal. Ensconced in the blue-tinged Palani Hills of Tamil Nadu, and located 2,000 metres above sea level, Kodaikanal spins a web of enchantment. The past is entwined with the fragrance of eucalyptus and pine and wafts into Tamara Kodai, a luxury retreat that winds languidly across 7.8 acres. At the heart of Tamara Kodai is what was originally Baynes Bungalow, built by a district judge. Subsequently, it was sold to Fr Louis Cyr, who rechristened the bungalow— La Providence – a place of rest, for the tired and sick priests of Nagapattinam. Today, La Providence is the charming, all-day dining restaurant of Tamara Kodai, which has retained the shell of the former monastic retreat and artfully absorbed it into the 53-suite resort. Memorable moments come a-calling at Tamara Kodai – dine at Bistro 1845, a French-style resto-bar or have breakfast on the open wood deck, under bright red umbrellas; warm your chilled fingers at a crackling fireplace in the lobby; play a love ballad on the grand piano; relax at the Elevation Spa (located in the former cells of the priests) as therapists run skilled fingers over your body; absorb the spiritual and dreamy vibe of the place. And finally, affirm and re-kindle your love for each other. Kodaikanal, a year-round resort, is a three-hour drive away from Madurai. Kodai Road is the closest railway station. Romance is embedded in the ancient stones of Chittoor Kottaram. The only living palace still owned by the Cochin royal family, this is a single-key heritage resort where you and your partner (or family) will be the sole guests. The minuscule palace-resort, located 7-km away from Fort Kochi, Kerala, can be accessed by steaming there in a boat that skims along the heaving-with-life backwaters of Kochi. A royal welcome awaits, after which the staff will address you as Maharaja and Maharani to make you feel like royalty. The palatial mansion rises on mint-green green lawns – a pillared one-storied structure with a weathered red-tiled roof – where multiple intimate spaces prompt guests to whisper sweet nothings to each other. Gaze at the pea-soup green backwaters and banks of water lilies, even as you plan your future together. With two bedrooms on the ground level and the Rajah’s room above, the palace hotel’s vintage ambience comes from elaborate meals served on pure silverware, expanses of polished wood, four-posters draped with flowing mosquito nets and stern portraits of royalty. As soft dusk comes sweeping in, head out on a boat cruise and serenade your love. Chittoor Kottaram is located 7-km from Fort Kochi and 15-km from Ernakulam. An idyllic base to explore Kochi, the palace is connected to the mainland by the Chittoor-Vaduthala bridge and can be accessed from the Varapuzha jetty, too. This is a year-round getaway and is pretty in the monsoon months, too. The imposing ramparts of Ahilya Fort in Maheshwar, Madhya Pradesh, tower over the sacred Narmada River like a shipwrecked galleon. Today, the ancient citadel has been converted into a 13-room boutique luxury resort owned and run by the debonair Prince Shivaji Rao Holkar, popularly known as Prince Richard. There are opportunities a-plenty to seal a pact of eternal togetherness in the utterly charming fortress strewn with period furniture, artefacts and sepia-tinted portraits of the royals of Indore. How about an intimate dinner in a turret of the floodlit fort, amidst a sea of flickering diyas? Sip cocktails as you gaze at the Narmada flowing past the shadowy outlines of the multiple shrines and the cenotaphs of the royals on the river bank. Each day is an awakening of the senses – mornings are ushered in with the chime of temple bells and the chanting of hymns; have lunch in the spectacular setting of an abandoned watch tower in the neighbouring medieval city of Mandu; enjoy high tea on the river as you glide on the broad expanse of a decorated skiff… Moments such as these are way too precious to squander! The best season to visit Maheshwar, a year-round destination, is between November and March. The closest airport and railway station are at Indore (91-km). Popular excursions are Mandu (40-km), strewn with relics of its proud past and the pilgrim town of Omkareshwar (61-km). The mountains are awash in shades of green as you drive up the Nilgiris to the off-the-grid hideaway of Kurumba Village Resort, sculpted into the slopes of a 10-acre spice plantation. The eco-friendly resort, near Coonoor, including its swimming pool was built without felling a single tree. As a result, the property is alive with the song of birds and the chatter of giant Malabar squirrels. The laughter of a waterfall, the grumblings of a stream, the rustle of trees flirting with the wind, the call of the whistling thrush… The song of the forest stays with you on an early morning bird-watching trail. A woodpecker tapping on a tree adds rhythm to the soundtrack on a forest trek that could be truncated should you run into a herd of gaur or elephants. Back at the resort, you cool off with a tall drink at the open-sided restaurant that has a ringside view of the forested slopes of Pakka Suran Mountain. Come sunset and romance is in the air. Savour the moment as you dine sumptuously in a treehouse or opt for the cave dining experience. Kurumbadi is an all-season destination. Coimbatore (56-km) is the nearest airport. Coonoor (19-km) on the Nilgiri Passenger (toy train) line is the closest station. Kurumba Village Resort is located away from the bustle of Ooty and Coonoor yet within striking distance of the hill stations. Your perception of me is a refection of you. The fragrance of the forest as it wafts around The Serai in Chikmagalur, Karnataka, is spiced with the rich aroma of coffee. Not surprising, as the all-suite luxury resort comprising of 29 villas nestles in the ample embrace of a lush 70-acre plantation in the heart of coffee country. Yes, it was in Chikmagalur that the first coffee beans in India (seven smuggled by a Sufi saint returning from Turkey) were planted. As all the villas either have private pools or Jacuzzis, the resort provides guests with the ideal setting to soak in the moments as they script their romantic story. And, there is more: candle-lit table-for-two dinners under the drooping roots of ancient banyan trees or in the kids’ plunge pool; a coffee-bean scrub in the couple’s room at the spa… Birds and butterflies with rainbows on their wings flutter around you on a plantation walk. Top off the trek with a ‘bean to cup’ experience at the restaurant-lounge where a coffee sommelier brews a perfect cuppa of the prized berry. Later in the day, cycle around aromatic coffee plantations or trek up to the summit of Mullayanagiri, the highest peak in Karnataka. Chikmagalur is a year-round destination. Bangalore (260-km) is the closest airport while Kadur (40-km) is the closest railway station. Chikmagalur bus station is 8-km from the resort.